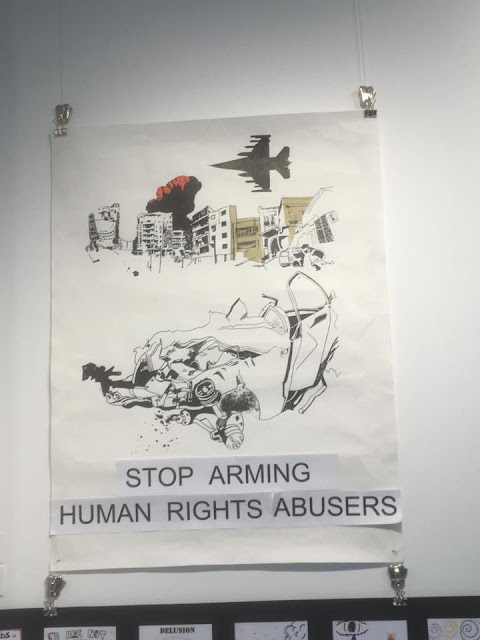 Independent Yemen Group contributes to the Collateral Damage exhibition at Kingston Quaker Centre to mark the 3rd anniversary of the war in Yemen. The tragedies that have unfolded in Yemen over the past three years are shocking and painful to watch especially for the British Yemeni community. Yemen is in the grip of a man-made tragedy which has caused untold suffering to innocent people. Failed by their own state, they have also been let down by the foreign states which were purporting to be their allies, including our own government. Many innocent people have become the collateral damage of the war in Yemen. 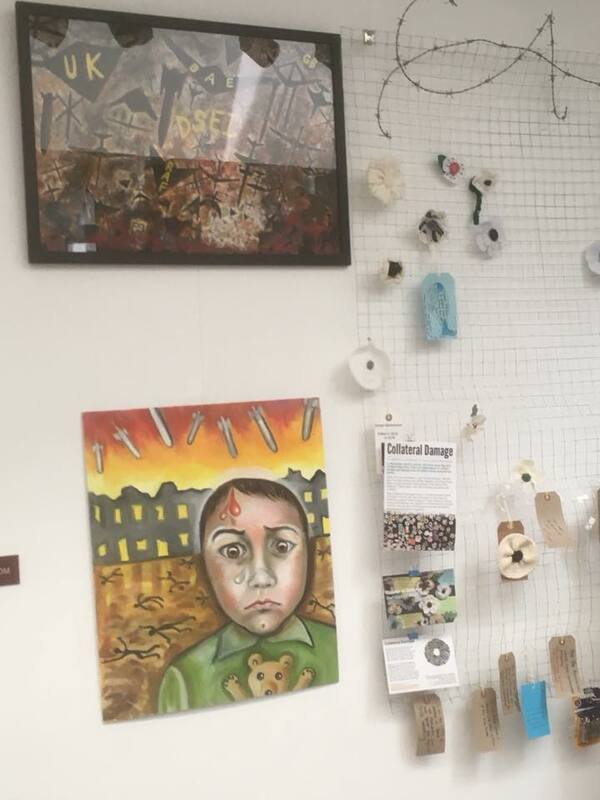 The exhi-bition on display at Kingston Quaker Centre features a wall of white poppies signifying the innocent civilian lives lost or shattered by war in the last century, since the end of Wrld War One. over the hundred years since during the wars. It includes tributes to victims from Syr-ia, Palestine and Iraq. 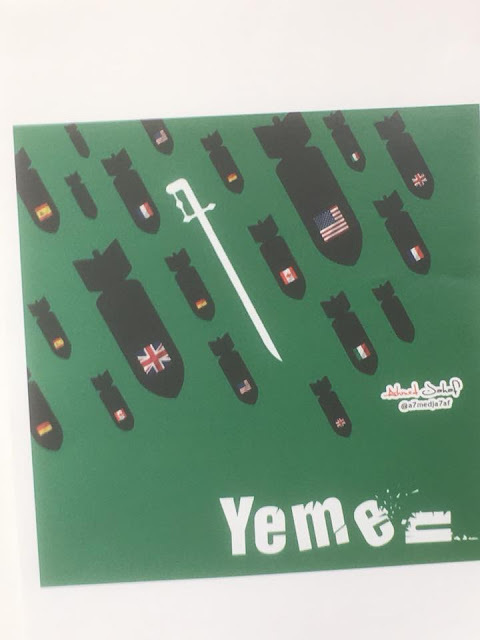 Independent Yemen Group will place white poppies dedicated to the children and babies who have starved to death, the elderly and the frail who have died of cholera, those who died due to unmet long-term health care needs, and those who were bombed to death in their own homes - all this as a direct consequence of the war which started on 26th March 2015. There can be no progress made towards a peaceful settlement in Yemen until all sides lay down their arms and put the interests of the people first. We urge the British government to stop supplying weapons and artillery to any side of the warring parties and play a genu-ine role in stopping the aggression on Yemen and start building the peace. For more information about this press release in relation to Yemen, please call Lubna Maktari, Director, or Nouria Nagi OBE (Yemen director) on 07738 762636. ▪ The UN estimates that more than 10,000 people have been killed in the conflict, with the ma-jority of the deaths as a result of the Saudi-led attacks. This is a not-for-profit organisation which works with migrant communities within the Kingston area as well as working with Yemeni communities around the UK and in Yemen. The organisation co-chairs the UK national partnership of GirlsNotBrides, the global organisation to end child marriage, and is an elected member of the Yemeni Communities Coordinating Committee and founding mem-ber of the Yemen Relief and Development Forum. The Collateral Damage projects invites anyone to make unique white poppies out of textiles to hon-our victims of any war since World War One. Poppies will be made over the coming months; instruc-tions are available and imagination is also encouraged. Each poppy will be unique, as is each hu-man being. A large scale installation of the poppies will be exhibited in Central London in the au-tumn, to commemorate the centenary of the end of that war. This is a small travelling exhibition of works responding to the arms trade, which were shown at Art the Arms Fair 2017. Most of the works are by Quaker artists. It includes a panel of the white poppies and people are welcome to add their own. weekdays. It will then travel to other parts of the country. Quakers have been worshipping in Kingston since the 17th Century and Kingston Meeting is still a thriving community today. Their new building won the ACE/Royal Institute of British Architects in 2015. As well as being a base for Quaker worship and witness rooms are hired to a number of local groups.